Capcom's earnings for the year ending March 31st 2013 aren't going to be as good as forecast. 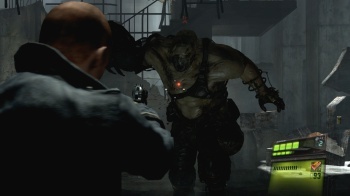 After claiming that Resident Evil 6 sales had been successful "to some degree", Capcom has since realized that "some degree" isn't going to be enough to meet targets. Capcom, in its latest financial forecast, has revised its earnings downward; sales, operating income, ordinary and net income are all expected to be less than forecast. Resident Evil 6, Capcom's latest entrant to its zombie apocalypse franchise, launched to great fanfare and initially had excellent sales. However reviews weren't exactly gushing, and soon sales targets were revised downward, from 7 million to 6 million units. This latest announcement indicates that even that lowball target isn't going to be met. Or, as Capcom bluntly puts it, "sales for this title are certain to fall short of the plan." So what was the overall plan, I hear you ask? Have a look at the Capcom earnings chart seen here. That shows a 33.7% drop in forecasted net income for the year, putting net income - that's earnings once expenses have been taken out - at slightly below the previous year's Â¥6,723 million ($80 million) final tally. Net sales are projected to be 11% less than forecast, which means that, where Capcom was expecting to see a significant sales bump over the previous financial year, instead actual sales are probably going to be broadly the same as before, with perhaps a modest increase over the 82,065 units moved in the 2012 financial year. Net income per share is also projected to be less in 2013 than it was in 2012. All in all, not a stellar year for Capcom, as the title it described as "dramatic horror" falls short - though perhaps not dramatically short - of its sales targets.